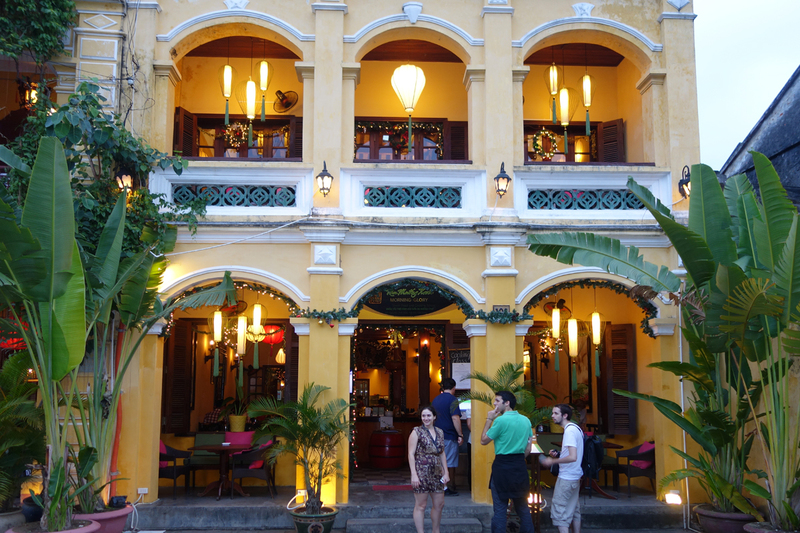 Next up on the agenda – – – a 3-hour drive south from Huế to the beautiful old port city of Hoi An. It was a pleasant and scenic drive and awfully nice to see some mountains again. The drive took us up over the top of a ridge of mountain and through the longest tunnel in S.E. Asia, Hai Van, (6.28 km). We saw a couple of large saw mills that produced pulp to make paper and press boards. 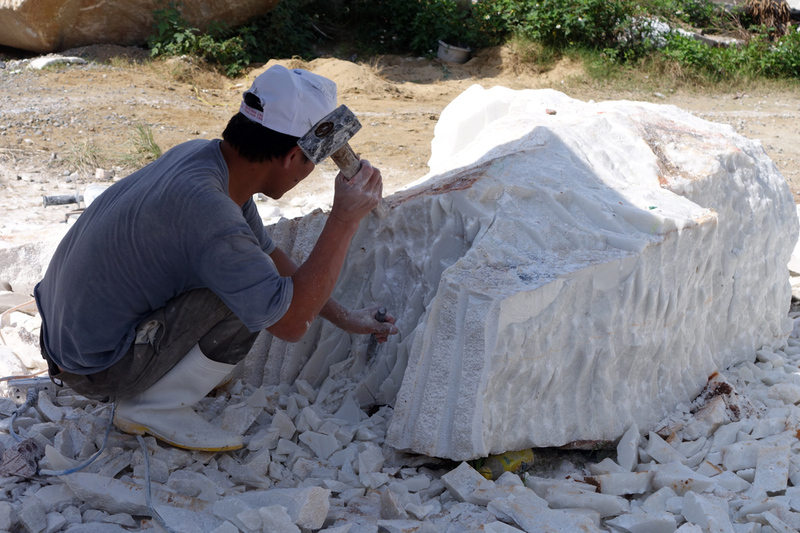 One pit-stop, and it was interesting, at ‘Marble Mountain’ just north of the city of DaNang, where The Vietnamese have been quarrying and carving marble for hundreds of years. Finished products for sale. 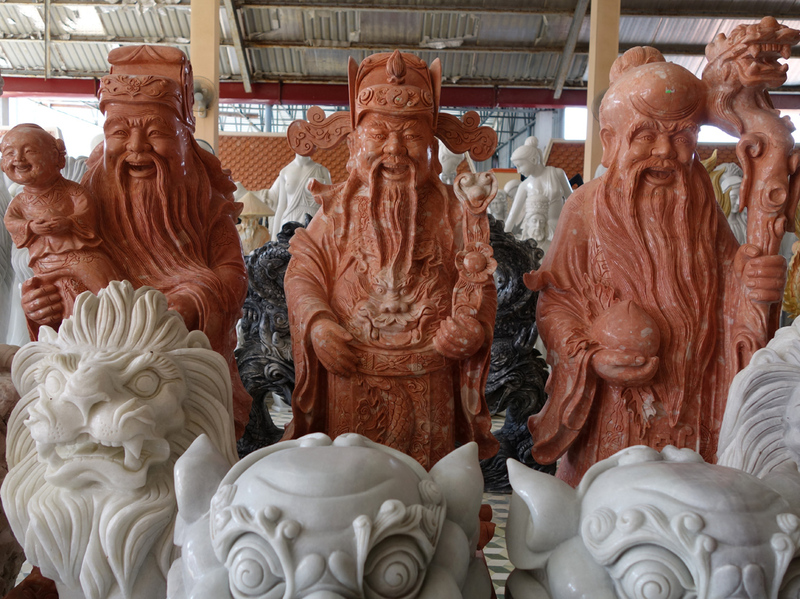 Gary wanted these 3 amigos for his garden. They were only 5-feet tall . . .
Our home for the next four days was on the beach at the Boutique Hoi An Resort. 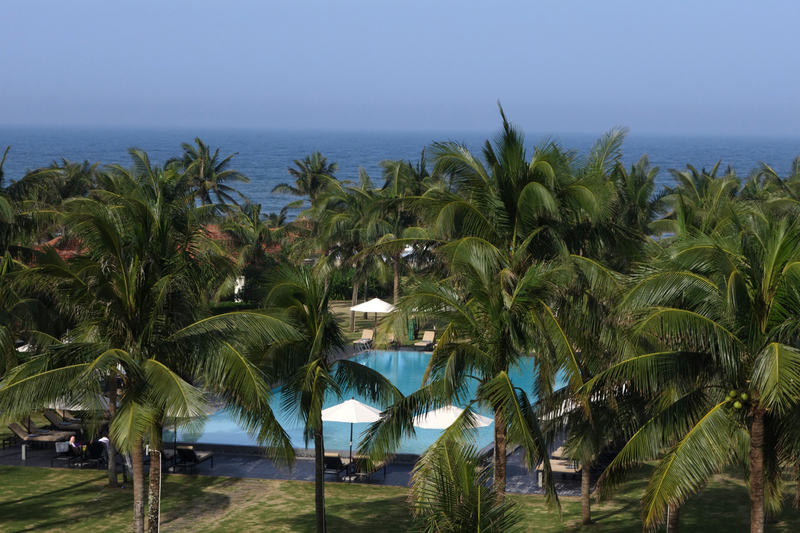 It is a beautiful place, with a spectacular setting on coast of the South China Sea. For those of you with a penchant for both war- and TV-history, this beach is connected to one called “China Beach” just a stones-throw on the north near DaNang. Of course DaNang was the major US hub for both air and sea power, not far south of the DMZ. China Beach was the go-to R&R center for all US combatants in the region. 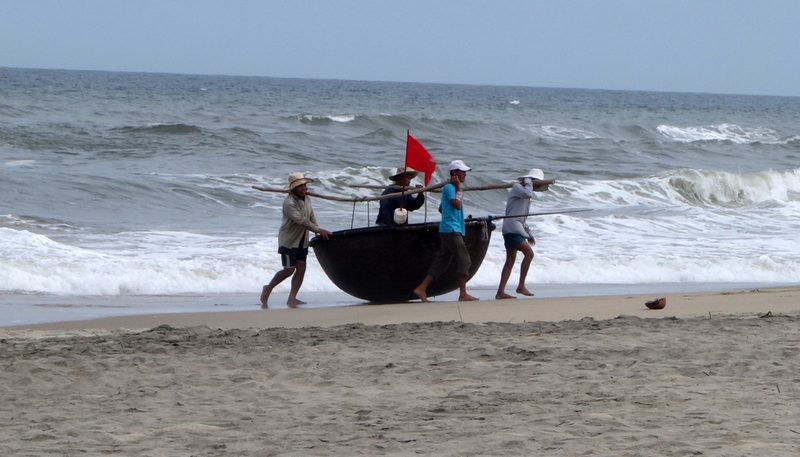 We loved walking the sandy beach and watching the fisherman in their “tub” boats (these are called ‘coracles’ locally). 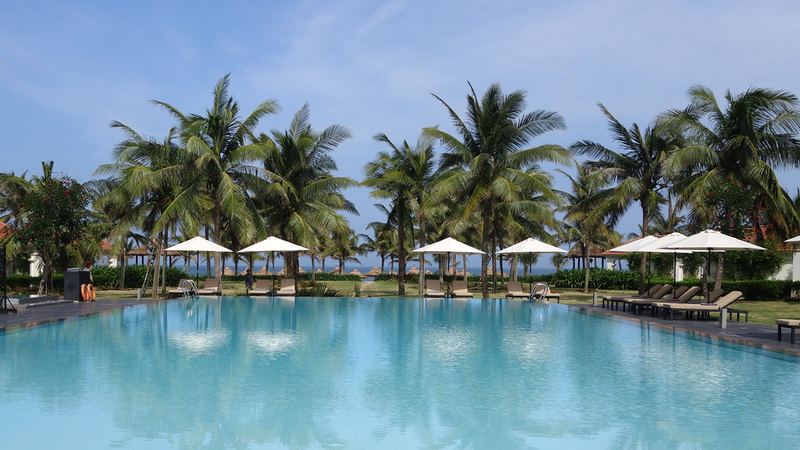 I am now getting used to luxury style hotels (4-5 star for me) – – being waited on all the time, enjoying wonderfully fresh Vietnamese meals, reading by the ocean or pool — it will be an adjustment when we go back home. But for now this is perfect! So relaxing . 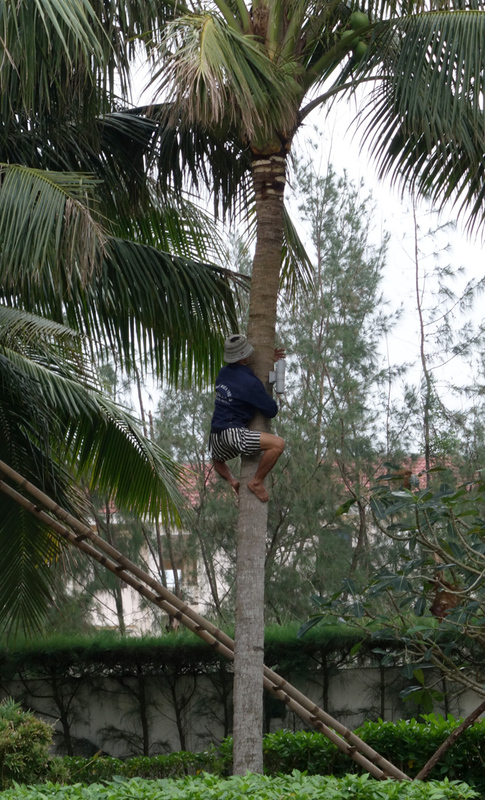 . .
Tree-trimming expert on the hotel grounds climbing down after sacking off some coconut branches. 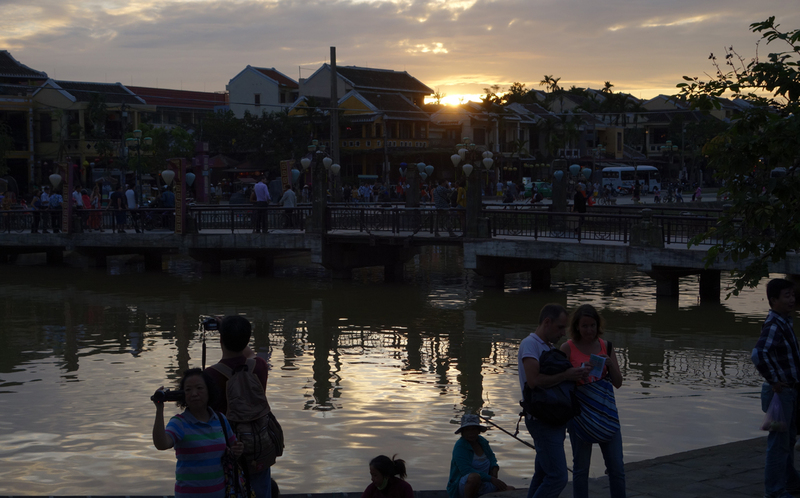 The old city of Hoi An was never ravaged by the war, nor has massive urbanization struck here as in most cities in Vietnam. During the 16th to 19th century it was on the main sea trading route form East to West. 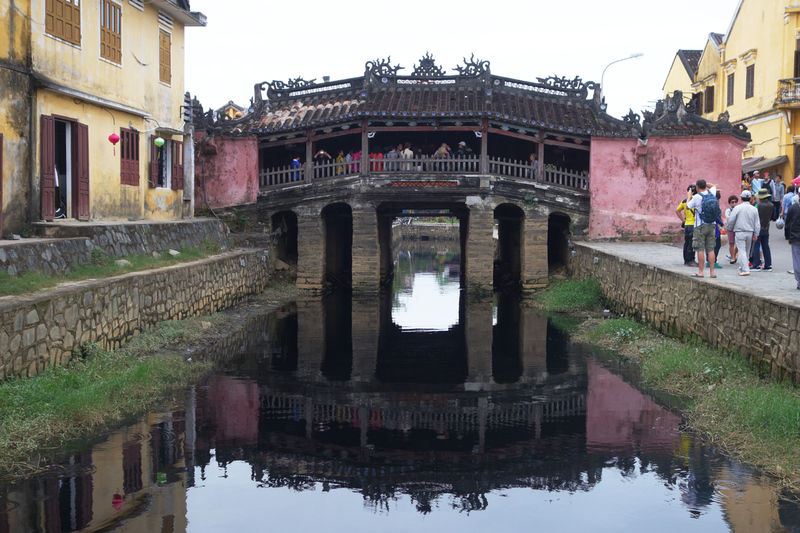 Thus, Hoi An inherited some of the unique values, from foods to culture to architectural style, of Vietnam, Japan, the Cham people, and the Chinese, not to mention the French. It is now, a bit sad to say, very much a tourist town, with every other shop seemingly a tailor (known for their silk suits). If I were among the working population again, I would consider having a few made! But no matter the amount of commercialism and tourists, this is a town that should be on everyones bucket-list for S.E.Asia! 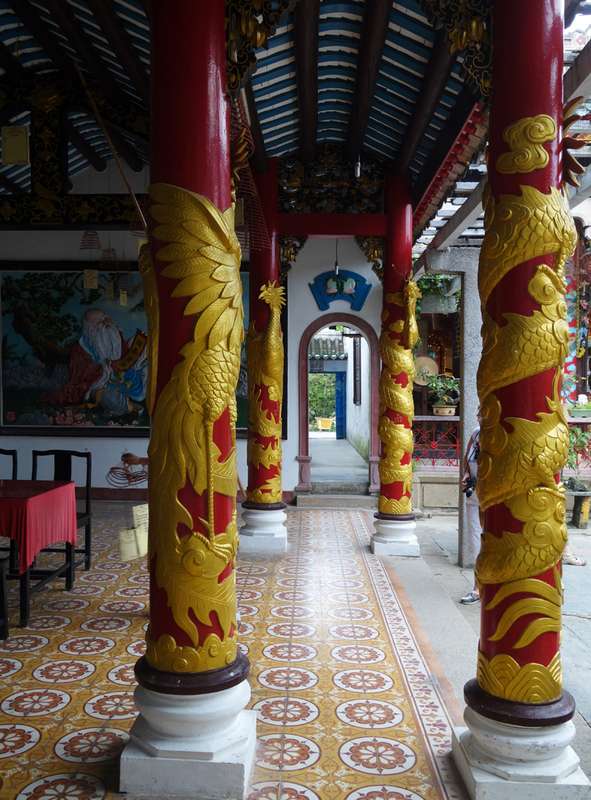 It also has some wonderfully preserved historical temples and homes that you can visit. We loved just walking around and taking in the sounds, sights, smells and ambience. And the food! (have I mentioned the Vietnamese food yet . . . 😚) We had a great dinner at the “Morning Glory” which also has cooking classes. We didn’t do a class as we have one scheduled later, but we were sorely tempted, as the food was excellent. In fact, we violated our long-standing tradition of never frequenting the same place twice within the week, cause it was so darn good. Parking lot in front of “the Morning Glory”. 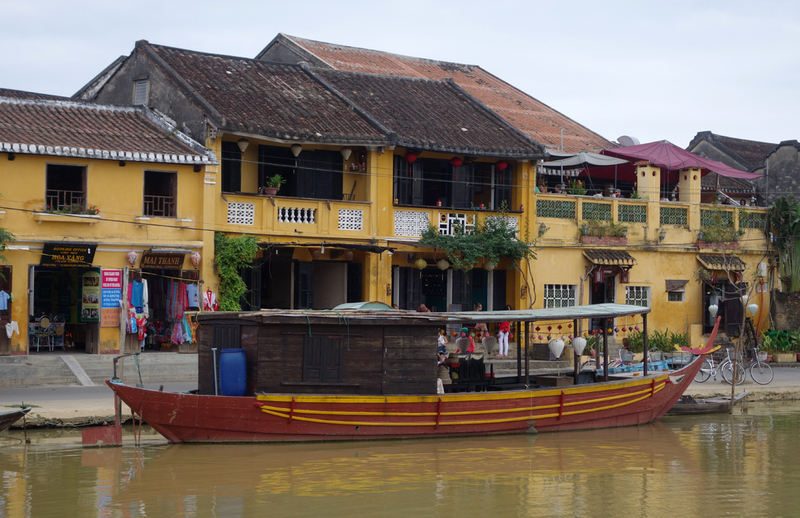 Along the riverfront — Hoi An was once a large and busy port, until it was eclipsed by nearby DaNang. 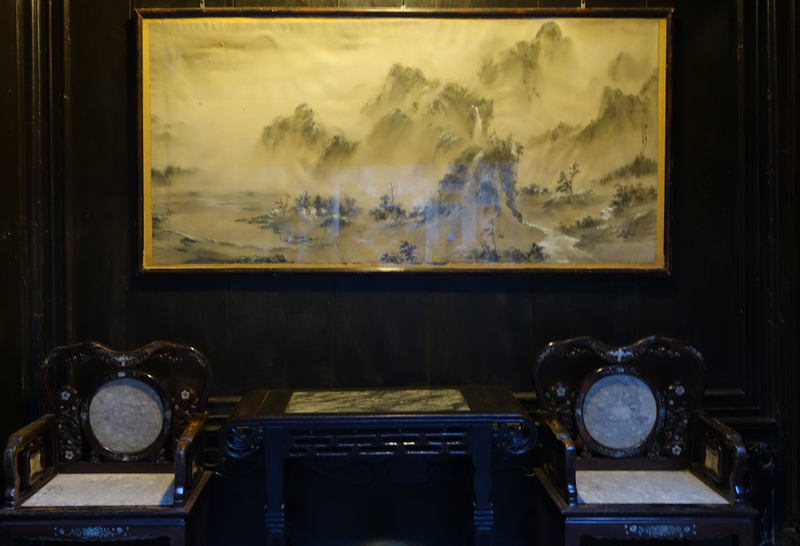 Tan Ky Home — seven generations of same family have continuously lived in this house. 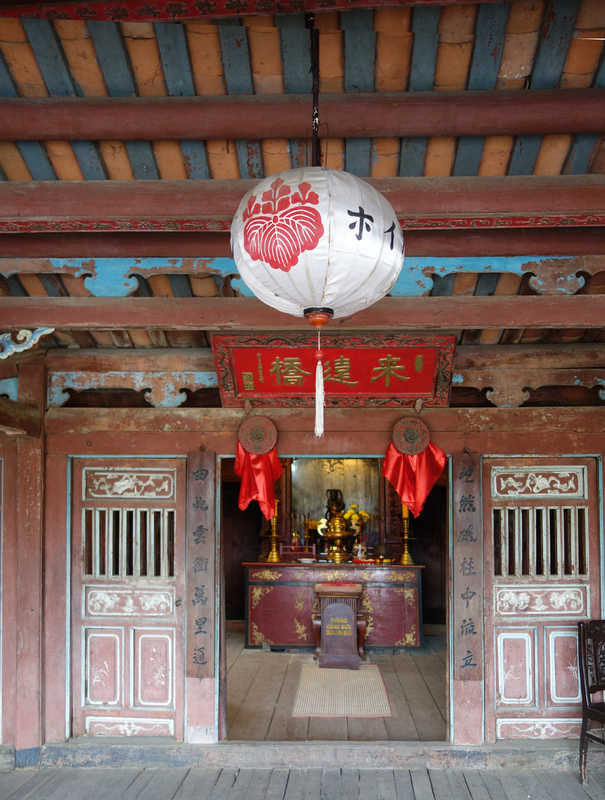 It is the most well-preserved old house in the city of Hoi An, bringing a combination of Japanese, Vietnamese, and Chinese elements. 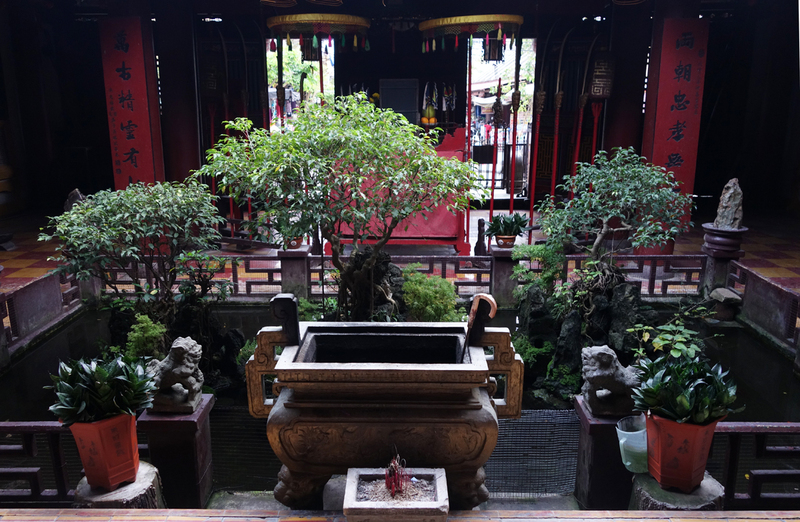 Inside a communal courtyard. 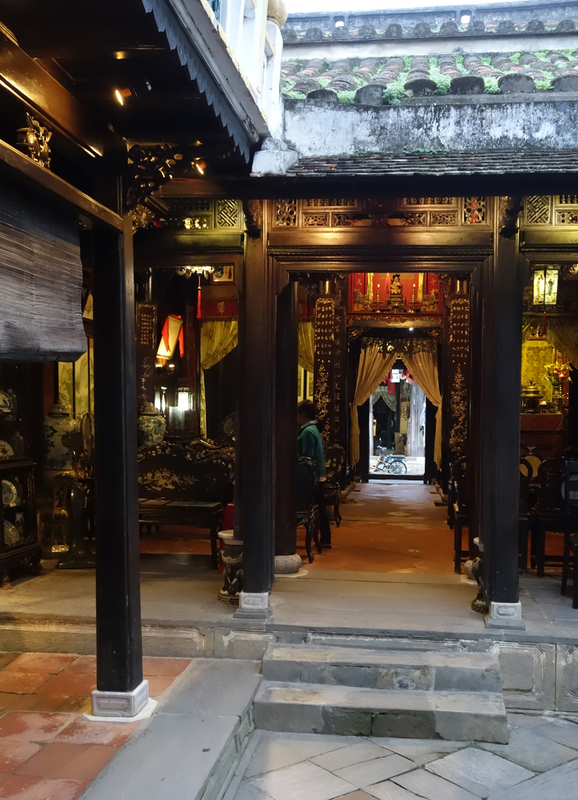 Very heavy Chinese influence in many of the preserved homes here. 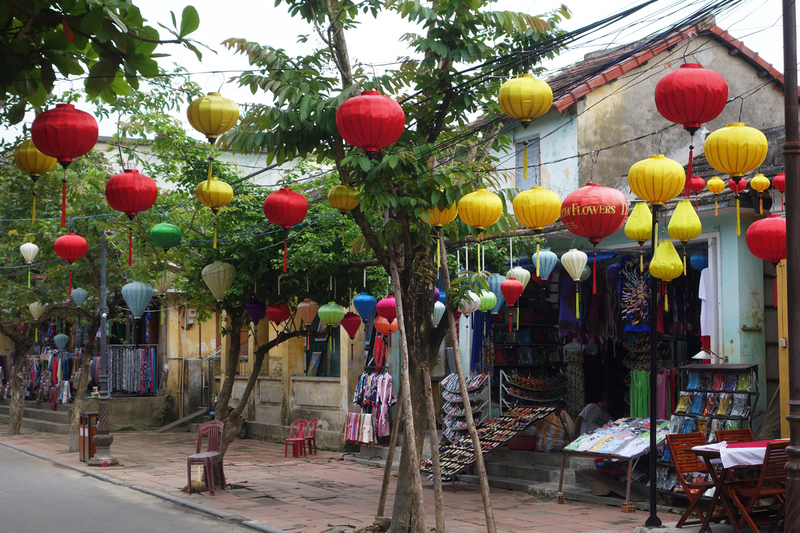 Beautiful lanterns — made in Hoi An. They are noted for them here. “Clever Crocs” from old ‘moto’- gears and chains — they do recycle everything. Couldn’t resist this one. 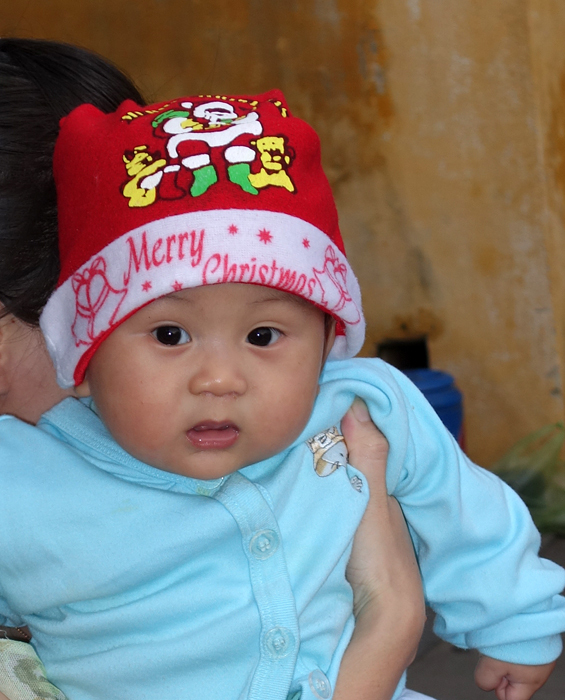 It turns out that Vietnam is the major supplier to China of birds nests for Birds-Nest-Soup! And at the current prices, they are cleaning up on this market. This painter is the same age as Gary. 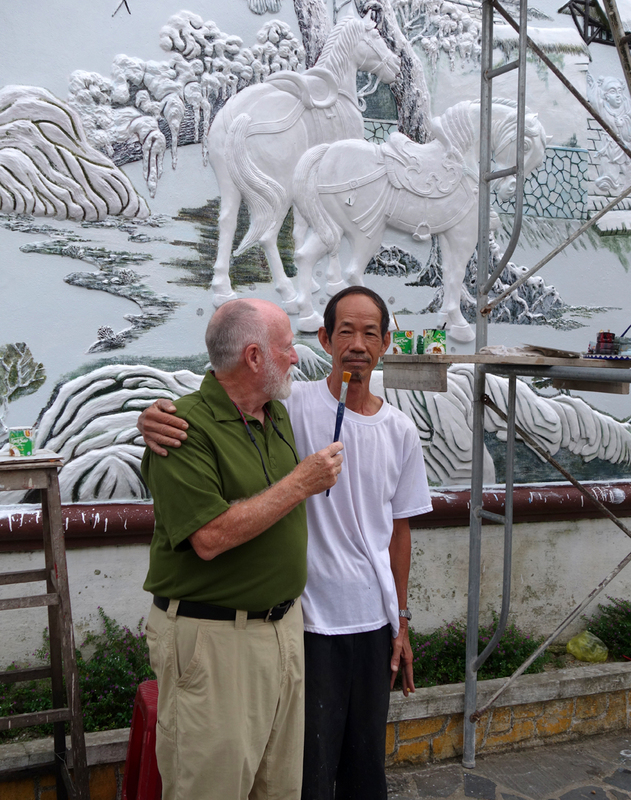 While I was setting up to take the picture, he gave Gary the paint brush to help him on the painting. A wonderful man! We communicated in haltering-French: not his, Gary’s! His project. 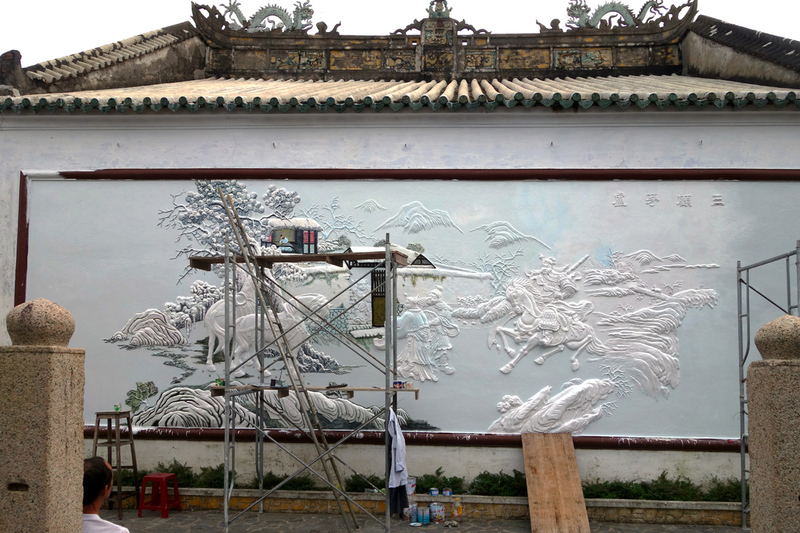 He is restoring this bas-relief on the back-side of a Chinese-style temple we just happened to find. Exquisite. 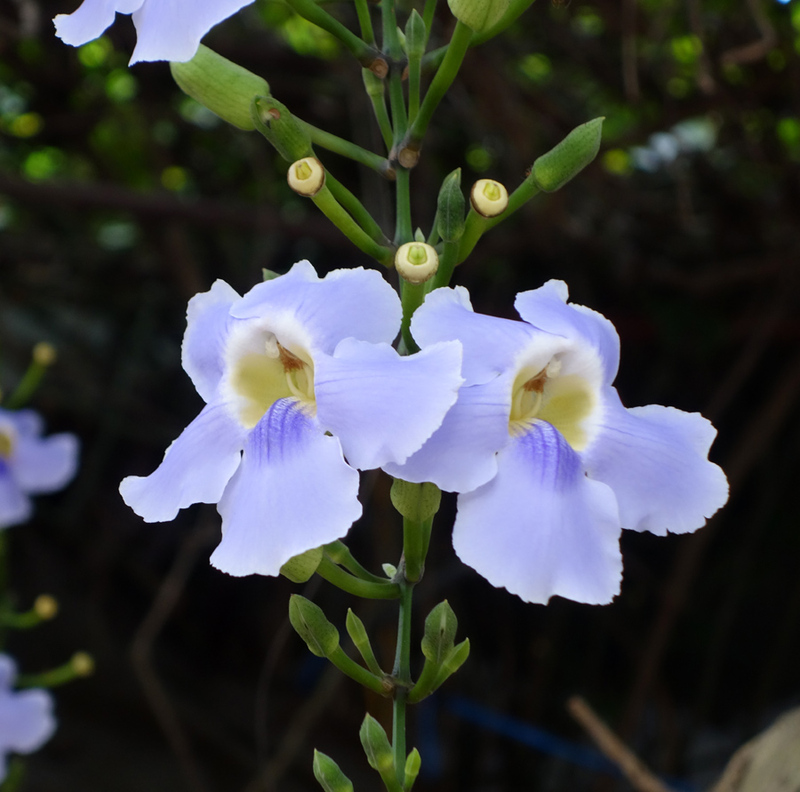 Flowers hanging down from tree in the street.Look a bit like an iris, but hanging from a vine. 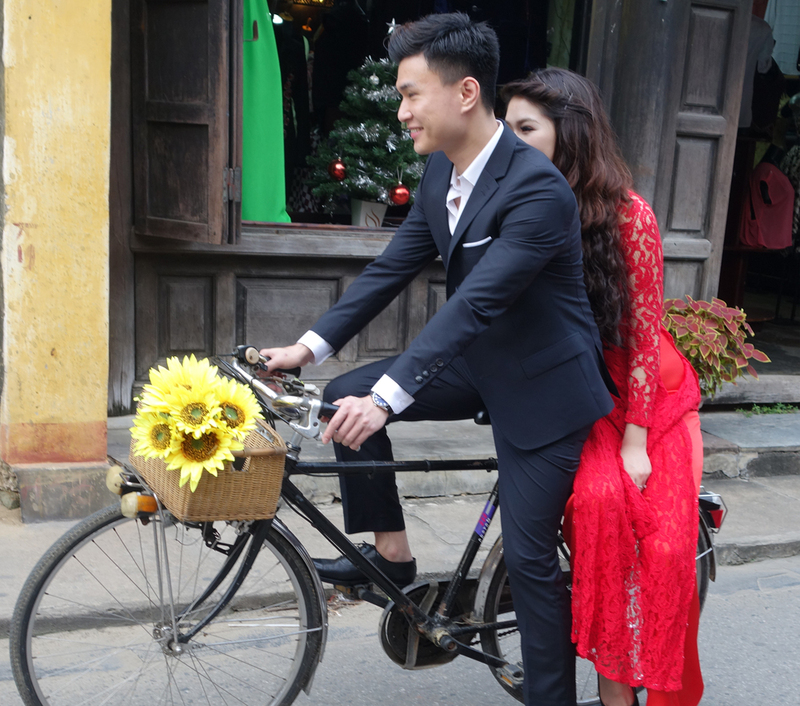 Loved this couple on a bicycle. They were headed to a wedding ceremony. 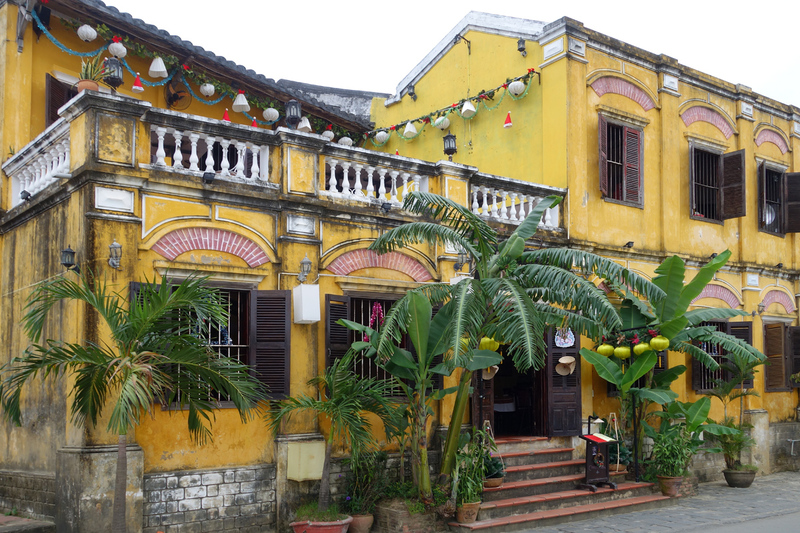 just another historical building (yawn); Lots of Chinese life still left in Hoi An. Wonderful designs. This is a Buddhist Pagoda in the middle of the covered Pink Japanese Bridge. 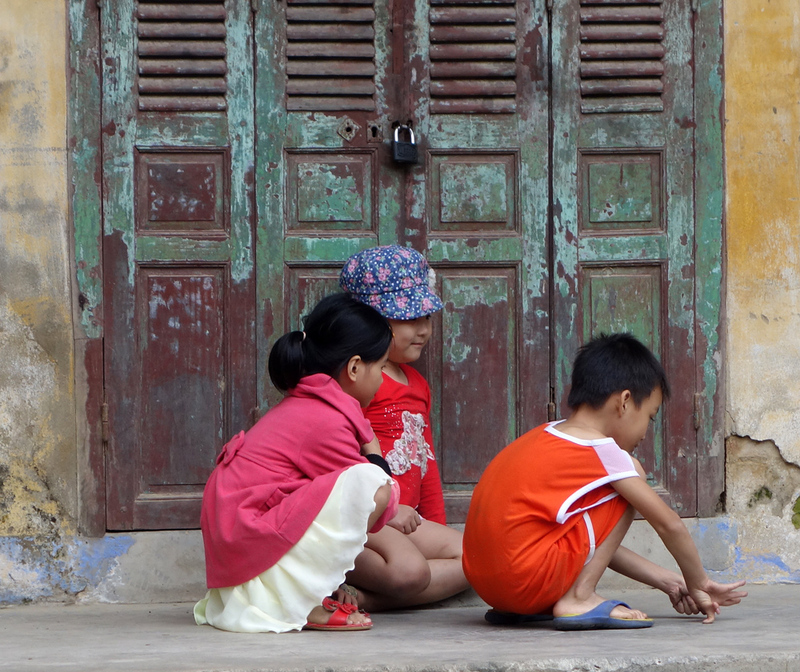 playing a game on the street. Kind-a looked like marbles, with a shell or stone. 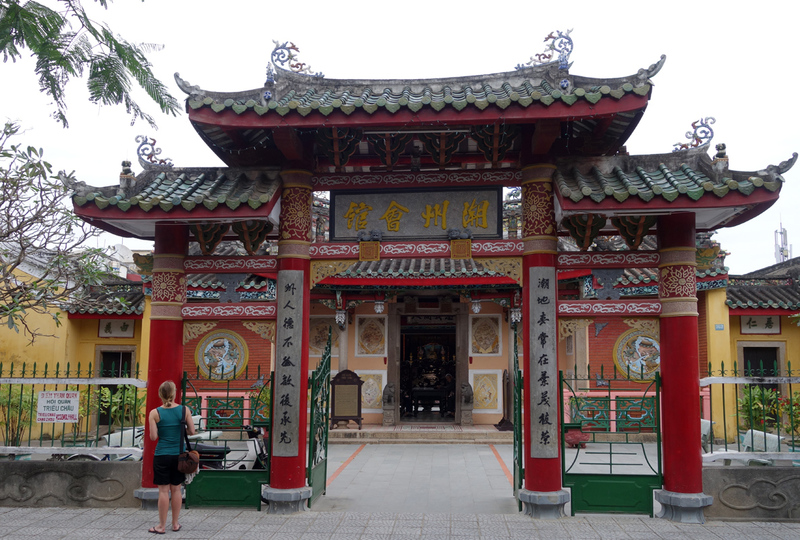 This temple of Chinese extract housed some artifacts from the oldest part of Hoi An’s history. A fascinating encounter occurred just as we were waiting for the sunset to occur along the river. A couple of high school ‘juniors’ asked if they could do a video interview with us for an English class assignment. 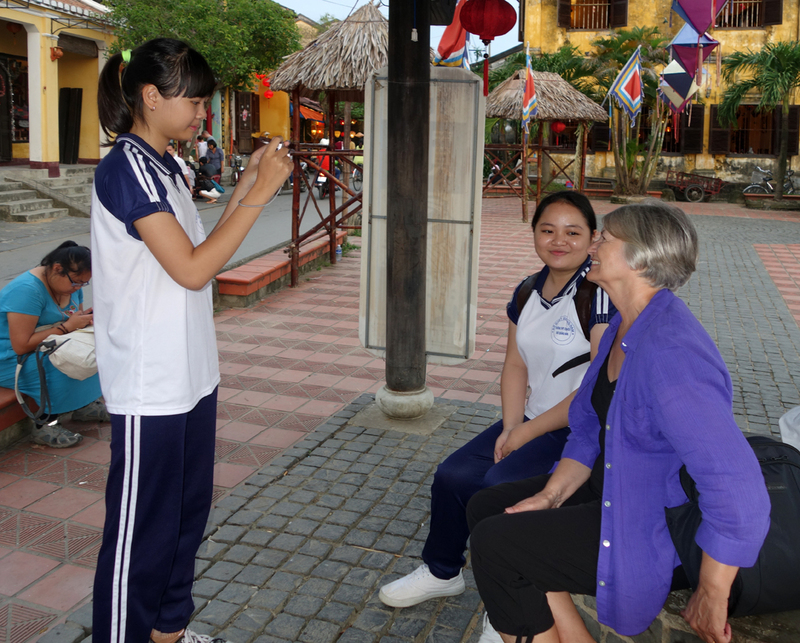 While one of them was interviewing one of us, the other captured a video on their small compact camera. They spoke very good English and were genuinely pleased that we had agreed to do the interview. (Seems a number of other European/American prospects had turned them down when asked, even though their language skills were superb). 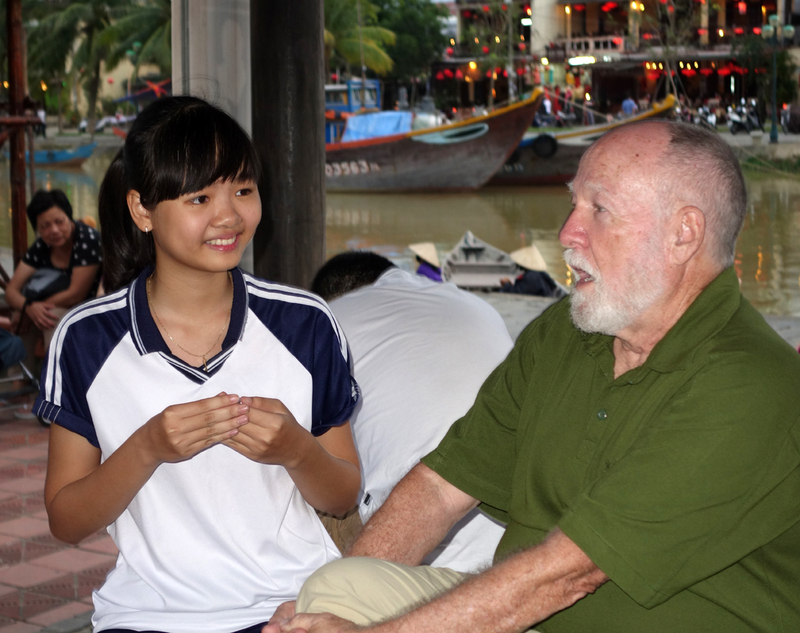 They were delightful young girls, and they wanted to know everything, including what we thought were the differences we saw between students in Vietnam and the US, what other places we visited in Vietnam, and if we liked the food in Vietnam and particularly HoiAn(! ), and whether it was too spicy for Americans. The questions were rapid-fire, with lots of laughter, and I thought we might be there for a l-o-n-g-t-i-m-e. It was so much fun; we both talked about them all evening over dinner at the Morning Glory. Video taping the interview — maybe on Vietnam U-Tube by now? Staying on the ocean has been so relaxing and cathartic; we have a great view from our room and we keep the balcony door open at night to listen to the waves as we go to sleep. Not sure we are going to ever leave this wonderful setting. 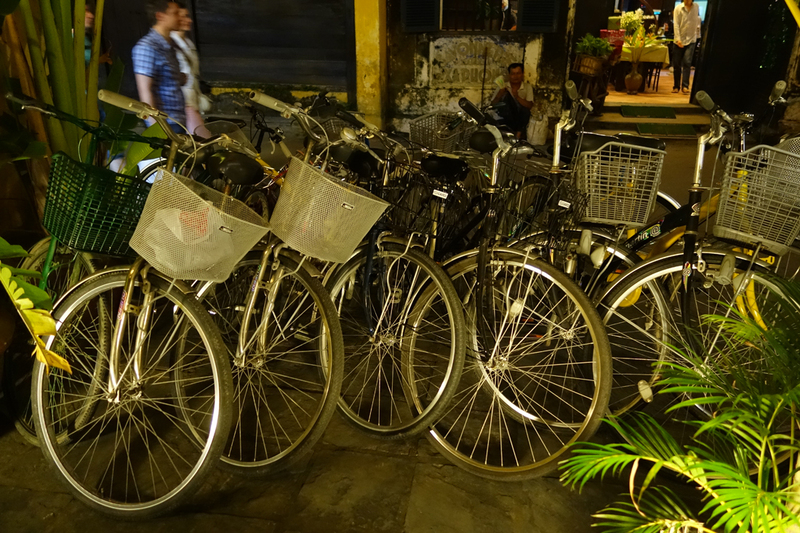 Hoi An is a remarkable place. We also loved watching the fishermen move their “tub” boats, or coracles, into and out of the sea, and how far they go out to cast their nets. The boats don’t have much of an edge, and the men stand on a platform only a few inches below the rim. They have great balance. 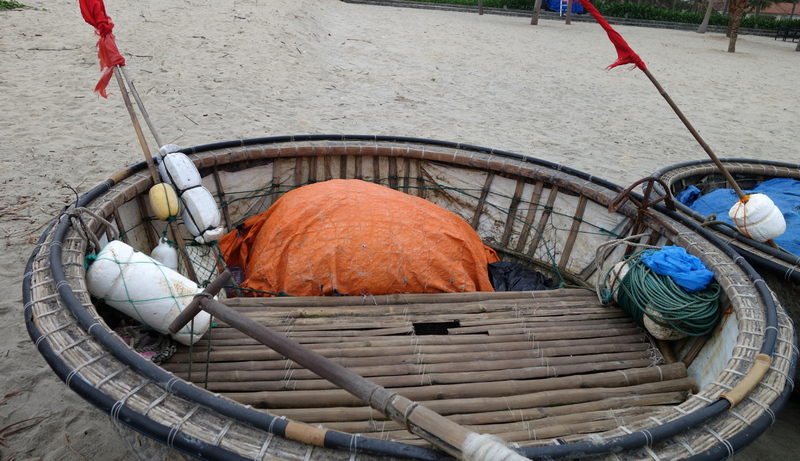 A coracle. Note the styrofoam weighted flags that they use to keep the nets up at the surface. 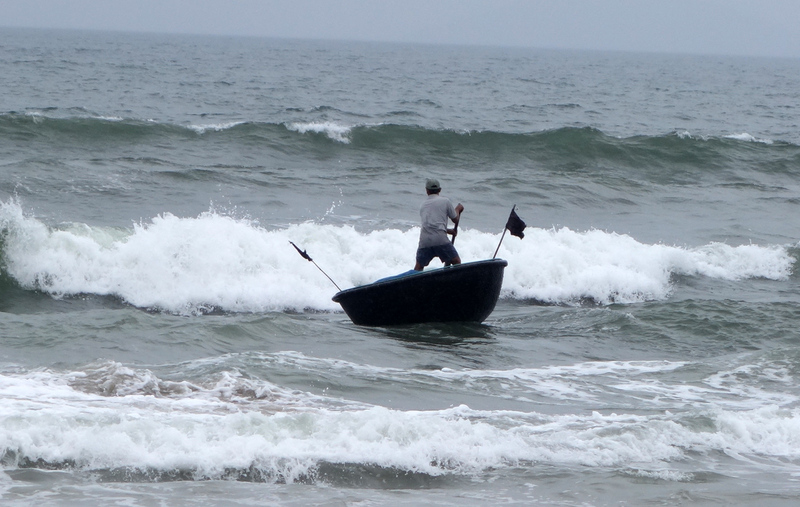 Going out to sea to cast his fishing nets. Uses one paddle! One man could lauch boat, but took four to bring them back up on the sand.